The Latino vote in the United States has for years been called the “sleeping giant.” It’s considered by some to be a monolith of untapped voters that has been dormant in states like Florida, Nevada, Arizona, and Colorado. This year, the giant might finally be waking up. In Florida, more than 130,000 Latino voters have already gone to the polls for early voting, according to the Clinton campaign, which is a 99% increase from this time last election. Latino voters could cast more than 10% of the votes in this election, up from less than 4% in 1992. All in all, a projected 27 million Latino voters are eligible to vote in 2016. For Hillary Clinton, this is good news. She currently leads Donald Trump with Latino voters by a margin of nearly 5-to-1, according to a Telemundo poll. This is even higher than the 3.5-to-1 margin Bill Clinton won in 1996 – the best year ever for a Democratic candidate in terms of the Latino vote. But the importance of Latino political participation goes far beyond just this November. As the Latino population continues to grow and diversify, it could change US politics irrevocably. 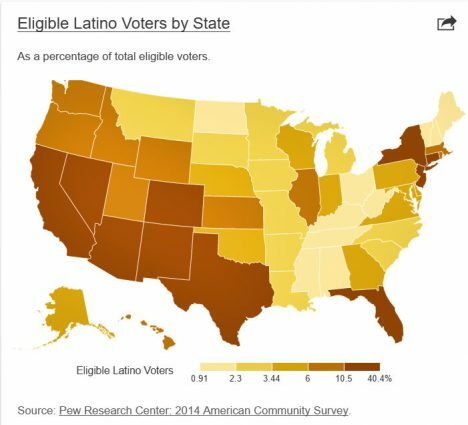 So, why has Latino voter turnout been so low in the first place? Let’s start with some numbers. In 2012, only 48% of eligible Latino voters cast a ballot, in comparison with 66% of black voters and 64% of white voters. And of those voters, more than 70% sided with President Obama. A variety of factors have impacted low levels of voter turnout in the Latino community, says Angelo Falcón, president of the non-partisan research center, the National Institute for Latino Policy (NILP). These include higher levels of poverty, under-representation in Congress, and the tenuous legal status of many Latinos. Another major factor that has depressed the Latino vote, according to Falcón, is the lack of attention paid to Latino issues. 86% of Latino voters said the economy will be very important to their vote in 2016. Another 80% voiced concerns about terrorism, while 68% said the environment was an important issue for them (compared to roughly half of total voters). For the Latino population, another major problem is its youth. 44 percent of Latino voters are “millennials” between the age of 18 and 35, according to the Pew study. Many of these voters have not been registered to vote. Millennials are notorious for low rates of voter registration. This rings especially true in the Latino community. For Falcón, part of the blame falls on the shoulders of the two major parties. In the past, neither party has sought out Latino voters. Even though the Democratic party has routinely won the Latino vote, “one thing that’s come across very clearly is that they haven’t put resources into mobilizing the Latino community in any kind of serious way,” Falcón said. In the sense that it has engaged Latino voters, Falcón sees the “Trump effect” as having positively impacted the Latino vote, though it has negatively impacted the Republican party’s share of that vote. Even in Florida, with its large and historically conservative Cuban population, Latinos are registering to vote with the Democratic party at a higher rate than they are for Republicans. In swing states like Florida, the Democratic Party’s rising tide can be seen in the combination of younger voters becoming eligible to cast a ballot and shifting demographics on a broader scale. The state is seeing a growing population of Puerto Rican voters, especially in cities like Orlando, and a flatlining population of Cubans. Nationally, more than 50% of the Latino voting population is of Mexican origin, with those of Puerto Rican heritage in a distant second and Cubans, third. The diversity of the Latino electorate has often been construed by Republicans as a reason they could still win over Latino voters, but Latinos seem to be increasingly voting as a unified bloc. 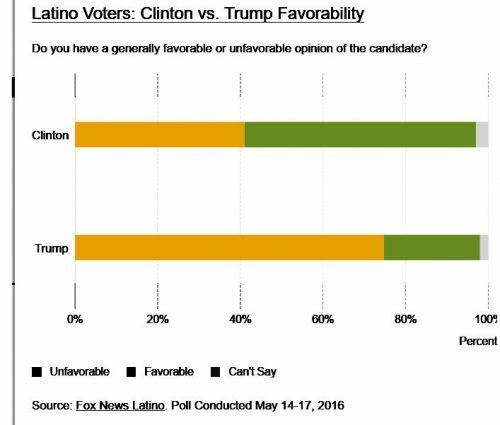 Trump’s divisive rhetoric with regards to the largest group of Latinos is not helping the Republican case. This, combined with shifting demographics in several key Sunbelt states – in Arizona, New Mexico, and Texas – more than 20 percent of eligible voters identify as Latino – could spell doom for the party of Lincoln. While voter registration is up for Latinos, Falcón still hopes to see political change on a more intrinsic level for Latinos, including higher levels of political representation and more civic participation. There are some bright spots for Latinos in politics – such as the campaign of Adriano Espaillat, who is on track to become the first ever Dominican congressman. But overall Latinos still make up just 8% of congress, in comparison with 17% of the population. If and when the “sleeping giant” awakens, this political disparity could become smaller, paving the way for a new and more level-headed discussion of Latino issues in the United States. This is something to vote for. Phineas Rueckert first published this in Global Citizen, He graduated from Macalester College with a degree in Political Science and International Studies, and spent the past year teaching English in Toulouse, France. He is originally from Brooklyn, New York. He can be reached at phineas.rueckert@globalcitizen.org.